Democrats Abroad is establishing a new caucus, the global Veterans and Military Families (VMF) Caucus. This caucus will work within Democrats Abroad to honor the men and women of the U.S. Armed Forces; their service deserves our deepest gratitude and respect. Government policies must reflect the interests of those who are serving and those who have served, including their families. This caucus will work to achieve this goal. All the various groups, ethnicities, persuasions, identities, and beliefs that make up American society are present in our military; we share issues and concerns in common with the other caucuses of Democrats Abroad. We share the principles and demands expressed in the platforms of both the Democratic Party and Democrats Abroad regarding veterans, active military and their families abroad. - Reach out to veterans, active duty and reserve military members as well as their dependents living abroad to encourage them to register to vote and to engage them in advocacy for our policy positions. - Provide a forum for DA members to understand better the issues and concerns affecting our military forces, veterans, and their families outside of the United States. - Provide a voice for veterans and military families to the Democratic Party Committee Aboard and the Democratic National Committee. 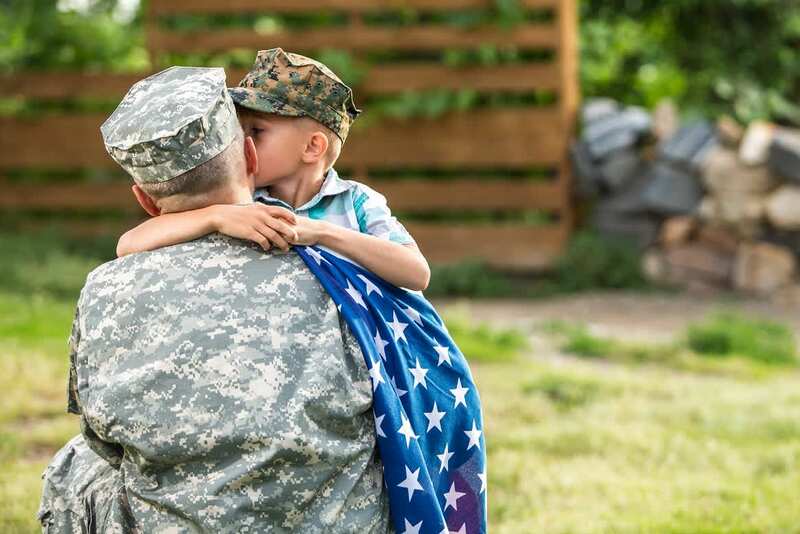 In addition to our stated goals, we also strive to act as a conduit to service members, veterans, and their families overseas by sharing information regarding benefits (e.g. VA and Tri-Care) and participate in commemorative services. To join us go to https://docs.google.com/forms/d/1l3OC9RA0OB_krEJvSF6emxJYGzDNZIeG1ZtcW65j5vI/edit. My name is Jon Roth, I am the current Vice Chair of DAN, and I am running to be Chair for the upcoming term. In concert with Audrey Camp, our outgoing Chair, and my fellow board members, I point proudly to the progress we have made in developing an outreach program that successfully harnessed the energy from our political wing coming out of 2016, which helped to begin the healing of political wounds and give our local constituency an outlet to organize and do our part to contribute to the achievements of 2018's blue wave! We leaned into partnership programming, expanded our communications and media relations activities and broadened our relationships with local businesses to promote and host our activities and visibility. My candidacy is one of continuity from the local engagement side, and of political experience and competence from a public facing perspective. My professional experience working in DC policy circles will prove valuable in the 2020 cycle, as the local interest in the presidential election will require a DAN leadership personality to consult with the media, and I am able to speak on all matters of politics and policy with articulate authority on behalf of us, our organization and our party. I humbly ask for your vote so we can continue our trajectory of progress and I look forward to welcoming and working with you all. I am Christina Skovsgaard and I was born a Democrat. The first time I attended a DA Global meeting in Toronto (2005), I knew I found a home. 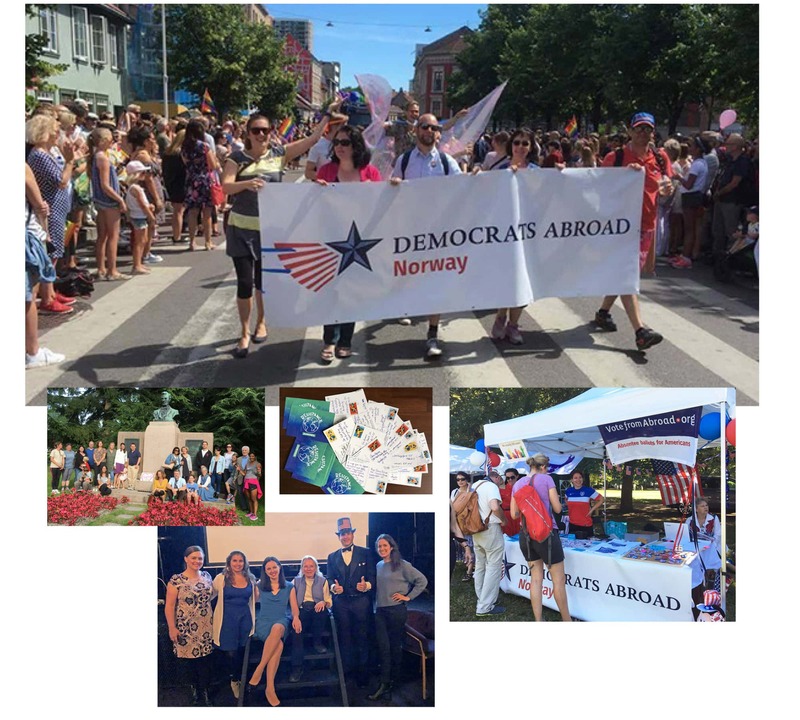 For the past 14 years, Democrats Abroad Norway has become an integral part of my life and has helped me have an active voice even while living abroad. Americans abroad are increasingly enduring unintended but seriously adverse impacts from US legislation that does not consider our unique circumstances. These policies can affect citizenship and it transmission, voting access, immigration and taxation. I’ve served DAN as the acting Vice-Chair (2008), volunteered for the 2008 Convention, was appointed as the International Representative in 2009 until 2015, and have served as Counsel from 2011 until 2017. I have been involved in voter-registration, phone-banking, fundraising, event planning, and Door-Knocking in DC (09,11,14,17). I’m the only board member to have attended all yearly regional and global DA meetings, also at my own expense (Brussels, Vancouver, Florence, Seoul, Japan DC.etc.). These activities not only allowed me to update myself on DA happenings and lobbying efforts, but also enabled me to build a community of fascinating American’s living around the world. I was happy to work with the new energic DAN board elected in 2017. They appointed me to be the “Get Out the Vote Coordinator”. I have taken the online course to become a Voting Assistance Officer. I also am now serving on the Steering Committee of the DA Global Women’s Caucus and the DA Global Black Caucus. In the US, for the 2018 election, I worked as a poll observer in Ohio. My Vision:DAN should enable Americans to use their voice. Senate and Congress races have been won due to our votes, opening eyes in DC. Some resolutions written by DA members are now part of the DNC platform. We should increase information and encourage social events. We need to encourage Chapter development to increase membership and participation thought out Norway. In a volunteer organization, it is vital to value the input of others and work as a team. In the many years that I’ve lived in Norway, first as a wife, then a mother and now as a happy grandmother, there has never been such a need for us to have our voices heard. 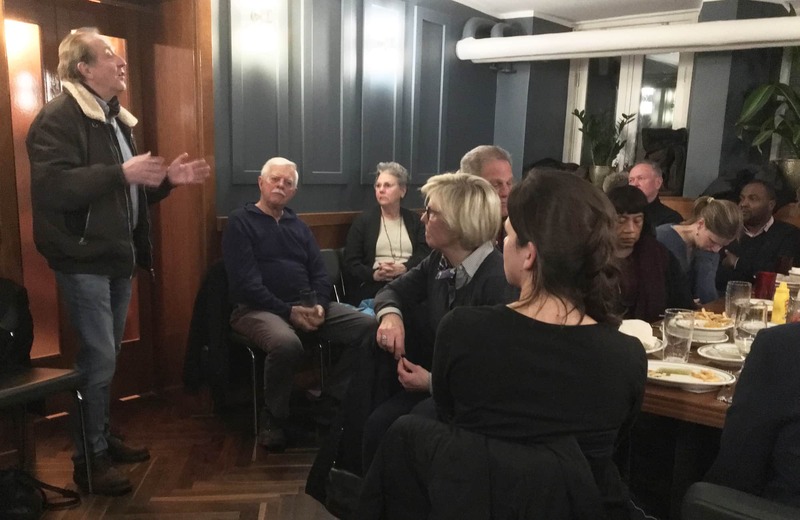 My name is Arna Desser and I’ve been actively engaged in political activities of one sort or another for almost 50 years, so I was very glad to find a group of like-minded people in Democrats Abroad Norway after the 2016 presidential election fiasco. 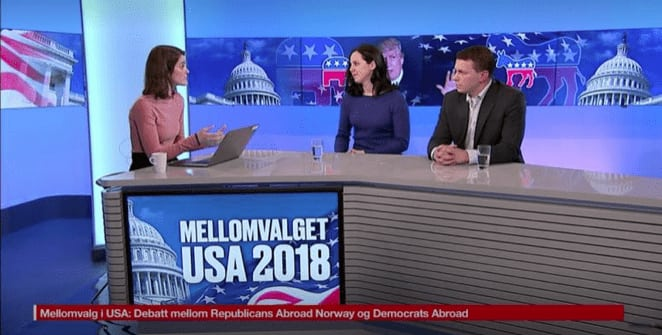 Participating regularly in DAN activities has given me the opportunity to cultivate new friendships with Americans in Norway and to feel engaged in political activities by helping in get-out-the-vote efforts. In addition to a deep commitment to social justice and an ability to listen and respond with respect to people with whom I disagree, I bring practical experience to the treasurer’s position. I’ve been the treasurer of the Hardanger Fiddle Association of America, a non-profit organization in the U.S. with an annual budget of about $35,000, since 1999, and, for the past several years, treasurer of one of the Norwegian dance groups in which I participate. I’m also relatively fluent in Norwegian. A few personal details: I’m a native Baltimorean (and fanatic Oriole fan) who moved to Norway almost 13 years ago. I have a Ph.D. in Economics from the University of Maryland and currently work as a health economist at the Norwegian Institute of Public Health performing cost-effectiveness analyses of new medications, medical devices and other types of health technologies. Shine a blue light! Midterms 2018. Thank you to everyone who came out to support and vote on these amendments at our 2018 AGM. 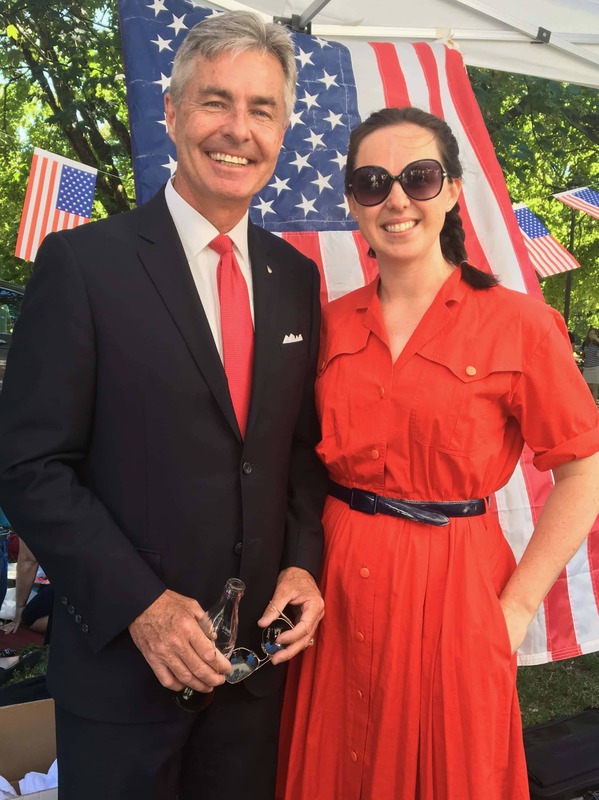 DAN joined The American Coordinating Council of Norway (ACCN) in celebration for the 33rd American Independence Day picnic in Frogner Park, Oslo. During the busy day we welcomed two new volunteers (thank you, Dana and Brooke!) along with our Ambassador to Norway, Kenneth J. Braithwaite, to our booth. 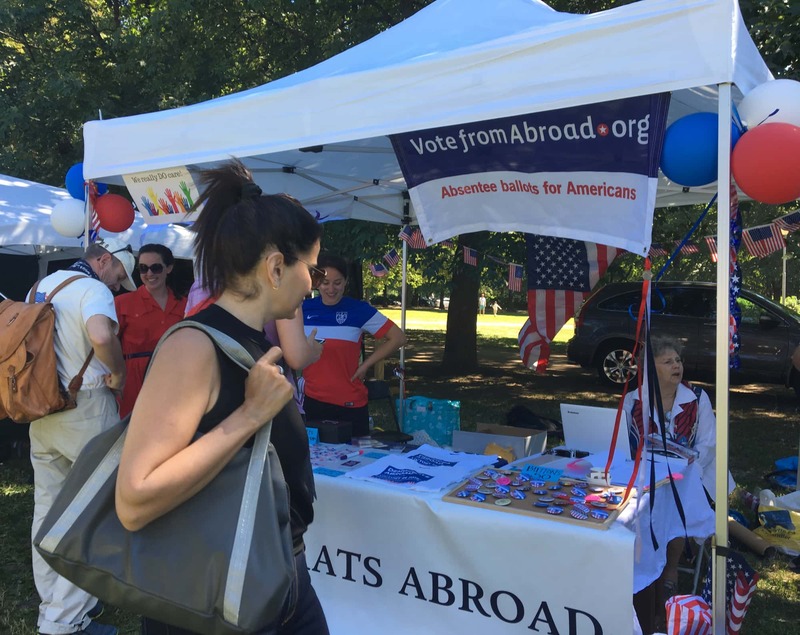 We also enjoyed wonderful weather and the many people who stopped by to ask about voting from abroad while discussing issues of the day. Below, DAN welcomes the first visitor to our booth. DAN Chair, Audrey Camp, with U.S. Ambassador Kenneth J. Braithwaite. 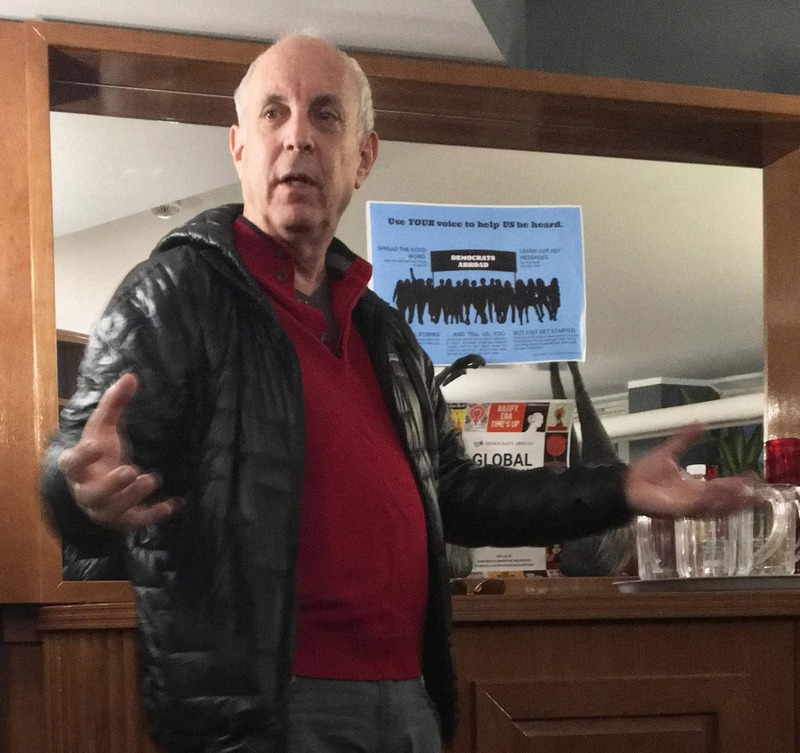 Larry spoke recently to a group of over twenty DAN members at the Nighthawk Diner’s new Bygdøy Allé restaurant. He covered a range of topics from the results of the Unity Reform Commission to burgeoning movements within the Democratic Party. Members representing States across the Union enjoyed sliders, chicken, and mac ‘n’ cheese while engaging in a conversation about organizing and the prospects of the party. The evening closed with DAN members introducing themselves and their motivation for participating in the party abroad, and a brief introduction from last-minute visitor Roy Pedersen, head of the Norwegian Confederation of Trade Unions’ (LO) branch in Oslo. Photo below, Roy Pedersen speaks to DAN members. 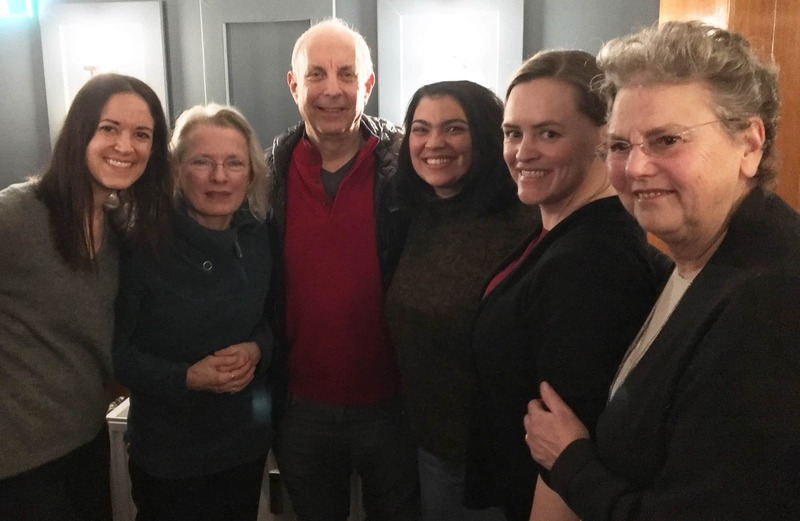 Below, Larry Cohen with DAN board members (l to r) Danielle K. DeRose, Kathy L. Kelley, Larry Cohen, Cori Ready, Corinne Hobson and Christina Skovsgaard. Starting on November 16th, you can drop off gently used items at Forandringshuset in Grønland each Thursday between 3pm-10pm. Have problems getting to Grønland but want to donate? Please send us message, and we will try to find an easier drop off location. Go to https://goo.gl/9wKhhr to send a message. We will also be taking donations at these local events. For more information go to our Facebook event at https://goo.gl/9wKhhr. 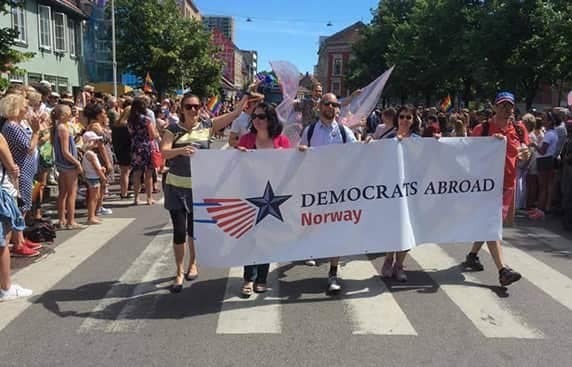 Democrats Abroad Norway (DAN) is excited to welcome members and friends to our website. We'll be keeping this page up-to-date with news about events we're planning in the time ahead, as well as opportunities for our members to get involved. Please also be sure to check out other sections of the site; consider this your one-stop-shop for initiatives fellow Democrats are working on here in Norway and elsewhere in the world, as well as ways you can make a difference in the party and the country while living abroad. Not yet a member? Register on this site today, and you'll hear from us soon. And please follow DAN on Facebook, where we post news about events we're planning, links to especially good articles on politics we've come across, resources for mobilizing against the Trump agenda, and so much more. This user-friendly step-by-step video shows how easy it is to register to vote from abroad using the DA online voter registration tool. Produced by DAN volunteers in collaboration with DA International this is a useful tool to get out the vote. To be shared far and wide! Go to https://goo.gl/YLCbga. 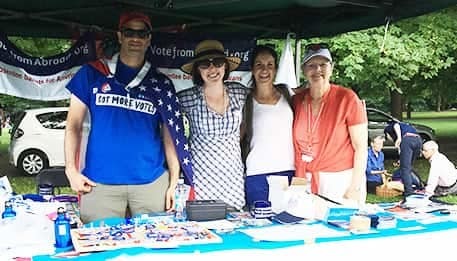 Top photo, Democrats Abroad Norway Vice Chair Jonathan Roth, Chair Audrey Camp, Legal Counsel Danielle DeRose and Christina Skovsgaard at the ACCN sponsored Independence Day - 4th of July celebration and picnic in Oslo. Bottom photo, DAN at Oslo Pride Parade.